Implementing SOA governance and management requires the consideration of three pillars: people, process, and technology. 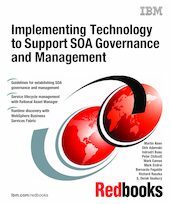 This IBM® Redbooks® publication addresses the third pillar, technology, demonstrating how to build advanced SOA solutions, and is intended for Technology professionals, Program Managers, Business Analysts, and Business Sponsors, including C-level executives. The first part introduces SOA governance and management, defines the IBM SOA governance and management method of plan, define, enable, and measure, and addresses the IBM SOA Foundation, SOA metadata, and the service life cycle. The second part uses a fictional telecommunications company business scenario to illustrate the use of technology in implementing SOA solutions with governance and management. This includes a detailed hands-on introduction to Rational Asset Manager, highlighting its governance capabilities. An additional chapter discusses the use of WebSphere® Business Services Fabric as a process run time and WebSphere Service Registry and Repository as a runtime repository for service discovery. We discuss how a layered mediation architecture supports SOA governance and how DataXtend Semantic Integrator can be used to implement service components for data mediation. Finally we discuss additional solutions for SOA management.